For those of you who love the romance of a gracious inn or Bed & Breakfast, there's no better place to kick back and relax than in Newport. Newport is famous for its natural seaside beauty and for the magnificent mansions and gardens built there by the industrial barons of America’s Gilded Age. But you don’t need to have a tiara or chauffeur to enjoy Newport’s treasures, from interesting museums to mansion tours to walks or bicycle tours along rocky coves. Newport was the playground of the wealthy (think Vanderbilts and Astors) from the 1880s to the early 20th century. Intimate, historic, and cozy bed and breakfasts are found throughout the historical seaside city of Newport, Rhode Island. RI bed breakfasts offer luxuries like private patios, romantically decorated theme room, flower gardens, swimming pools, hot tubs, and fine antiques. 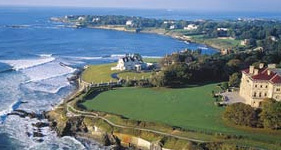 Most are located in walking distance of world-class attractions like the Newport mansions and Cliff Walk in Newport. And, of course, they are specialists in breakfast: lavish, tasty, and, more often than not, locally produced. Almondy Inn - Newport, RI – The Almondy Bed and Breakfast Inn, offering some of the finest Newport Rhode Island lodging, is conveniently located in downtown Newport, just steps from famed Bannister's and Bowen's Wharfs. This elegant 1890's Bed and Breakfast has been restored to its original glory and is located within walking distance of Newport's fine restaurants, antique shops, galleries, boutiques and near the various famous Newport Mansions and island beaches. The Almondy Inn is an 1890 three-story Queen Anne-style home featuring a turret, dormer windows and a classic wraparound porch set off with white columns and turned-spindle railing. The inn hosts an evening reception with wine and appetizers in the parlor, which features a fireplace, a large bay window, a crystal chandelier suspended from the ceiling and hardwood floors softened with oriental rugs. Admiral Farragut Inn Bed and Breakfast - Newport, RI – Nestled in the historic district two blocks from the bustling shops and harbor, the Admiral Farragut Inn is located in Newport, R.I. The inn is positioned on Clarke Street, which offers historic sites, restaurants, mansions and shops. The Wanton-Lyman Hazard House, a historic 1697 house, is one-quarter mile away. The inn is less than two blocks from Newport Harbor. The Admiral Farragut Inn offers 17 guestrooms with antique four-poster featherbeds. Accommodations include private bathrooms. Spring Seasons Inn - Newport, RI – Our classic Victorian Newport Rhode Island Bed and Breakfast lodging offers amenities that will make your stay memorable. Candlelight breakfast, Jacuzzi style baths and our location close to waterfront dining, shopping and attractions make our Newport Rhode Island Bed and Breakfast perfect for your Rhode Island escape. The lovely gardens and window boxes are "Newport in Bloom" award winners every year. Explore the treasures of Newport and beyond from our exquisite bed and breakfast Newport RI lodging hideaway. The Kitt Shepley House 1932 - Newport, RI – The Kitt Shepley House is a quaint bed and breakfast located in Historic Hill Newport, Rhode Island. Walk the cobblestone streets to the waterfront where you will find numerous shops, museums and restaurants. 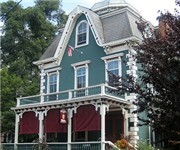 A Victorian Colonial style B&B offering 2 European guest suites, French and Italian, each with a Jacuzzi for relaxing. The picturesque front gardens and window boxes have resulted in honors & awards by "Newport in Bloom." Awards presented each year on the Terrace at The Marble House. The Pilgrim House Inn - Newport, RI – The Pilgrim House Inn Bed and Breakfast, a perfect Newport Rhode Island vacation getaway. Our victorian style bed & breakfast offers quaint lodging for your New England vacation and brings the elegance and sophistication of Newport RI right to you. Located on historic Spring Street, the Inn has been beautifully restored, offering charming room accommodations with classic period furnishings. The Pilgrim House Inn Bed and Breakfast, located in Newport, Rhode Island, on historic Spring Street, is an elegant old-world hotel in the heart of this fabled port city. The Chanler at Cliff Walk - Newport, RI – An historic, luxury, European styled boutique hotel, the Chanler at Cliff Walk boasts the best ocean view in Newport. Only steps from the beach and a mile from downtown, it is the first mansion and only hotel located on the famous Cliff Walk. Recently ranked #1 Recommended Hotel in Newport by TripAdvisor.com, come experience the difference at The Chanler at Cliff Walk. The Chanler offers twenty exquisitely appointed guest rooms, each with its own historically inspired period details as well as the romantic and award-winning Spiced Pear dining room and ocean-side, outdoor Terrace restaurant, offering the discerning traveler a glimpse of Newport’s Golden Age. Yankee Peddler Inn - Newport, RI – The Yankee Peddler Inn in Newport, RI offers rare charm and easy elegance - immediately making guests feel right at home at our cozy Newport hotel. This Victorian style colonial New England inn is one of the oldest Historic Inns of Newport, and affords each visitor a unique experience while visiting the Newport area. The Yankee Peddler Inn’s location, tucked into the historic streets of downtown Newport offers a peaceful getaway, just steps from Newport’s exciting waterfront. Pearls of Newport - Newport, RI – These outstanding Luxury Inns are within steps of the heart of downtown Newport, RI. They offer the beauty and tranquility of one of the finest gardens Newport offers. Pearls was named after Pearl Aaron Meyerson. Pearl was an inspiration and a role model for style, fine food and gracious living. It has become the standard practice for Pearls of Newport. The property in Newport includes a 1750 early Colonial home, a 1825 Federalist gem, and a 1858 Victorian Mansion. Amenities include Ralph Lauren home goods, Rosenthal crystal, breath-taking antiques, flat screen TV's, wireless internet, free domestic calling, XM radio, patios, decks, hot tub, fireplaces, massage, manicure and pedicure. Enjoy a wonderful breakfast and a late afternoon treat. Sarah Kendall House - Newport, RI – No visit to Newport is complete without a stay at the Sarah Kendall House, an elegant empire Victorian in the City-By-The-Sea’s historic Point neighborhood. The national and international media have raved about our stunning bed and breakfast across from Newport Harbor, praising everything from the waterviews and antique furnishings to our outstanding hospitality. Stay at the Sarah Kendall House, built in 1871 for the wife of a wealthy shipping merchant, and elevate your next visit to one of the country’s most unforgettable destinations. 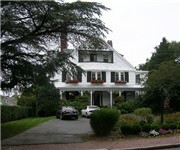 Hilltop Inn Bed and Breakfast - Newport, RI – Hilltop Inn, Newport, Rhode Island's newest historic inn. Offering an exacting standard of luxury service in a fabulous central location, Hilltop combines the elegant sophistication of a bygone age coupled with the most modern appointments. Hilltop enjoys the best location in the city: at the outset of Bellevue Avenue, two blocks from the bustling wharves, historic Washington Square and artsy Broadway, the Inn stands proudly in a grand turn-of-the-century residential neighborhood. Adele Turner Inn Bed & Breakfast - Newport, RI – Newport RI's Quintessential Bed And Breakfast - Named one of America's Top 10 Most Romantic Getaway Bed and Breakfast Inns, Adele Turner sits quietly tucked away in one of Newport, Rhode Island's most historic in-town neighborhoods, amid 2 and 3-century-old homes. Recognition "Sumptuously Romantic, Opulent," Weekends for Two in New England. "Affordable Luxury," SmarterTravel.Com Top Newport Pick. Bayberry Inn of Newport - Newport, RI – Bayberry Inn of Newport is a boutique hotel located in the Historic District of downtown Newport. Bayberry Inn of Newport is an elegantly restored 1837 Spanish Victorian with splendid lawns, private parking and a wrap-around front porch perfect for enjoying a quiet evening. We are just a quick stroll to popular shopping, restaurants, and Newport attractions. The Bayberry Inn of Newport is walking distance to beaches, Bellvue Avenue, Thames Street, Touro Synagogue, Banister's Wharf, Bowen's Wharf, International Tennis Hall of Fame and many attractions. La Farge Perry House - Newport, RI – Newport, Rhode Island B&B: Welcome sums up this charming, luxury bed and breakfast inn in the heart of historic Newport. The acclaimed La Farge Perry House Bed and Breakfast Inn offers the very best in elegant Newport lodging. From the enticing smells of fresh cookies baking in the oven to the beautifully appointed rooms and surroundings, you’ll find La Farge Perry House a first-class bed and breakfast experience! Touro Park Inn - Newport, RI – The Touro Park Inn is located in Newport, R.I., at the top of Heritage Hill. The inn is nestled in Touro Park, home of the mysterious Old Stone Mill, a 24-foot fieldstone structure whose builders remain unknown to this day. Bellevue Avenue features mansions dating back to the Gilded Age one-quarter mile away. Newport's historic waterfront offers shops and restaurants less than one mile away. Easton's Beach is one mile from the inn. Inn on Bellevue Bed & Breakfast - Newport, RI – The Inn on Bellevue, located in Newport, R.I., is within two blocks of the Touro Synagogue, America's oldest synagogue and a National Historic Site. The inn is within the synagogue's Eruv. Shopping and dining in the downtown waterfront area are two blocks away. The beach and historic Newport mansions are four blocks from the inn. Built in 1891, the Inn on Bellevue was once the home of a well-known silversmith. The inn features Victorian era decor. 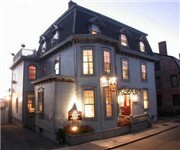 The Victorian Ladies Inn - Newport, RI – Intimate, traditional Newport Rhode Island bed & breakfast. Voted the best b&b of Newport! The Victorian Ladies Inn in the beautiful historic seaport of Newport, RI. Inside you'll find graciously-appointed rooms, full baths and plenty of outside gardens in which to relax and enjoy your time in Newport. Whether you're interested in Newport's famous mansions, fine dining, or shopping, The Inn is a short walk to all of Newport's attractions including nearby beaches, the Colonial town, famed mansions, Cliff Walk and harborfront dining.